Now I can look back at the "bad Bobby caregiver" and the "good Bobby caregiver." It took more than four years before I finally understood that it is unhealthy and often disconcerting to interrupt a person who is deeply forgetful. It now surprises me that it took so long. No one likes to be interrupted or disrupted when they are doing something. It is annoying. Have you ever felt disconcerted, or even angry when someone interrupts you? Can't they see you are doing something? In this case interrupting refers to the act of suddenly stopping or disrupting a person who is living with Alzheimer's or a related dementia. This usually happened when my mother, Dotty, was doing something that was disconcerting to me. For example, maybe she had the door open on the refrigerator freezer and was examining the food. To me this seemed odd. This action seemed so odd and disconcerting that I would step in and ask Dotty to close the freezer door. Of course, I was focused in on my own agenda. I wanted the freezer door closed. When Dotty would go storming out of the kitchen, and then go into her bedroom and crawl into bed refusing to come out, I would get confused and sometime angry. After all, I had asked her politely to close the door on the freezer. And besides, it is not a good idea to leave the freezer door open for long periods of time. That was my agenda and point of view. This agenda lead to Dotty feeling less than adequate, confused, and unhappy. I suppose you could say, she couldn't understand why I was being so mean to her. These actions also lead to me sitting in another room room feeling sad, confused, and with both a heart ache and stomach ache. 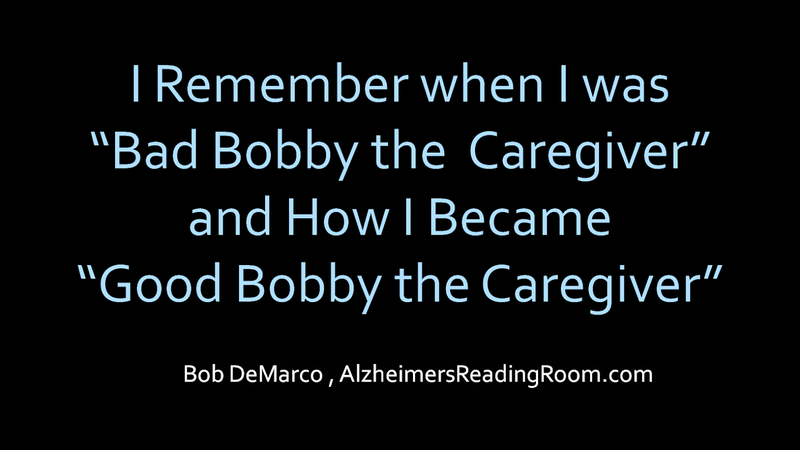 After I crossed over into Alzheimer's World, I began to look at things from Dotty's point of view. It did not seem unnatural to her to examine the items in the freezer, and to start opening them up to see what was inside. In the real world that does seem a bit nutty. So here is the lesson I learned. It was much more effective to stand over to the side with mouth shut and observe. If Dotty was not doing something that could harm her, or something that would burn down our home, I let her continue doing what she was doing. As it turned out, over time, I would stand there not feeling all bent out of shape, but with a smile on my face. In some respects her Alzheimer's World actions became entertaining, sometimes I stood there in amazement. After all, I could repair anything that needed to be repaired in a minute or so after she finished. Instead of feeling angry or upset, I was happy as I watched Dotty. Happy that Dotty was still able to use her brain, her eyes, and her hands all in concert. When I was in the habit of interrupting, disrupting, or correcting Dotty, the blow back was instantaneous. She would either go in her bedroom and refuse to come out, or she would get angry and start cursing me out. Since all the acts and actions we perform each day with a person who is deeply forgetful are cumulative they often dictate how the day is going to go. -- it was going to be a rotten day. A day filled with burden. The blow back from Dotty was sure to come sooner or later that day -- "get out, I don't want you here, I can take care of myself". Does this every happen to you? 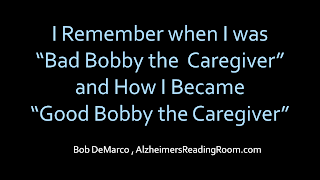 Once I realized that the actions Dotty was taking were normal in Alzheimer's World, I stopped interfering with what Dotty felt she needed to do. I just stood back and took it all in. Instead of overreacting and making both of us miserable, we both ended up happy and smiling. Happiness and smiling can also have a cumulative effect. Good day, day filled with Joy. In situations like the one I described above I finally started asking myself, "what is wrong with me"? Why was I making such a big deal out of nothing? What couldn't I accept that Dotty needed to do her "thing". There comes a time when you will be "very happy" when your loved one continues to do things even if they seem a bit "whacky" at times. I can say I am happy that I finally allowed Dotty to do what she needed to do without interrupting her. Previously, I wrote about how I decided early on that "Dotty and I would continue living our life." It took me another two years to finally understand that this included allowing Dotty to live her life.